WTB guru and all-round good guy Jason Moeschler is no stranger to New Zealand and Spoke, featuring in the latest issue with Mark Weir and the KRD guys on their trip around the south. 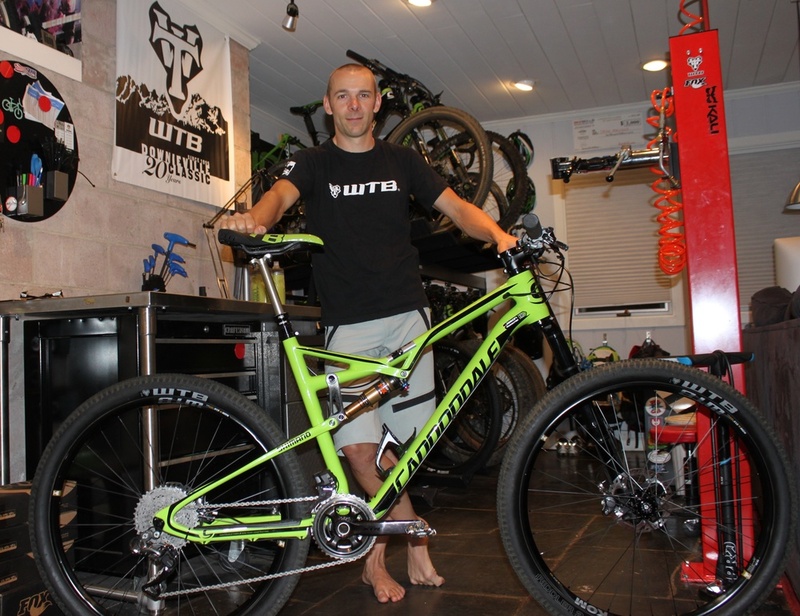 Jason is also no stranger to the Downieville All Mountain Worlds, having raced it for many years finally cracking the win this year on board the just-released Cannondale Habit. Many thanks to Jason and Lisa who took the time to give us an insight into what it takes to win Downieville, and the set-up of his bike. Downieville is one of those races that makes choosing a bike very, very hard. The race is two days, consisting of a 43.5km Cross Country Race with 1890m of climbing on Saturday, and a Downhill race on Sunday, which is a 1360m drop (with 159m of climb) in 24km. Each day, you are awarded points based on your finish placing. At the end of the weekend, the points are combined to give you an overall, All Mountain placing. Yes, the racing is a battle all in itself, but choosing the right bike feels like half the battle. You will see everything from full on XC race rigs, to 160mm bikes with 203mm rotors out on the race track. For me, the key is to use a bike that can get up the climbs as quickly as possible, and do the same on the descents. Those who know Downieville know that it is a bike breaker. Choose a bike and parts that are too light duty, and you won’t make it to the finish. Back in September of 2014, Cannondale notified me that they would produce a new 27.5” wheel, 120mm trail bike, called the Habit. I knew this bike would be a consideration to race for Downieville. Fast forward to three weeks before the race. The bike was delivered while I was out of town at another race, so my time to build the bike and test, was extremely compressed. You know how you get on a bike, and just feel at home? The Habit was one of those bikes. It felt so good, everywhere. I knew after my first pre ride in Downieville, that this would be the bike of choice. It was as comfortable and fast going down, as it was going up. Choosing the frame is great. Choosing the parts is yet again, another battle. The Habit comes stock with a SuperMax 120mm Lefty Fork. If you haven’t tired a Lefty, you should. For the rear shock, I used the new Fox Float DPS. Both front and rear were set to 30% sag. My drivetrain was unique for Downieville - it’s possible I was the only rider using a Shimano Di2 double chainring with Syncro shift. I chose a 28/38t front chainring combo, and 11/40t rear cog set up. The Di2 Syncro function shifts both front and rear derailleurs, meaning I only had a right side shifter. Most people worry about the chain retention on 2x. The new XTR equipment has the best chain stability on the market. Tires are a huge consideration for a race like Downieville. Again, my choice was completely unique among the racers, except for Nathan Riddle himself. I chose a WTB Riddler 2.4 TCS Tough/Fast Rolling for the rear, and WTB Riddler 2.4 TCS Light/Fast Rolling for the front, with 4 scoops of WTB TCS Sealant inside each tire. Most would consider the Riddler tread design to be too “pinner” for Downieville. Weir, Riddle and I have been pushing the limits of the Riddler tire for the past few months in a few different events, and I knew that this tire choice was going to be the fastest. The tires were mounted to WTB’s KOM i23 aluminum rims. KOM is possibly the lightest aluminum rim you would ever want on a mountain bike - lighter than most carbon rims. The advantage of aluminum over carbon in a race like Downieville is that if you do happen blow through the travel of the tire and strike a rock with the rim, the worse that will happen is a dented rim, which on the KOM rim, results in your tire bead being clamped even tighter to the rim.